~Anna’s always around; flitting from flower to flower, buzzing by our heads, sitting on my favorite dead dwarf peach (another story), squeaking at us, or just generally flying about. 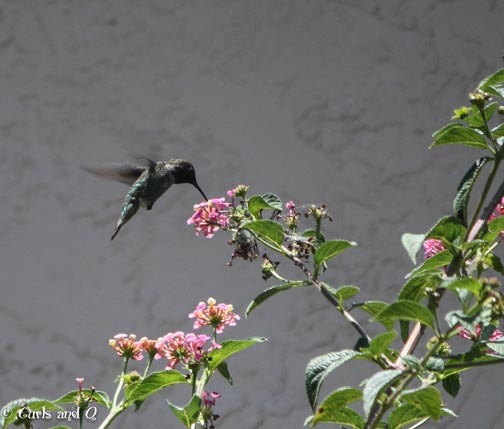 This hummingbird does not migrate from our area, even in the coldest San Diego weather, Anna is always around. We are amazed at how brazen this bird is, I guess without any natural predators she doesn’t have to be afraid. I know there are he’s, I swear I see the female more even though the male is “prettier” with the gorgeous red neck feathers. During the fall, if we leave the front door open Anna’s will fly in straight through the house and try to get out of the vaulted-roof-high window. The Hubs has had to save many a hummer. He climbs up a ladder and plucks the bird down when it’s become too tired to fly. Holding the bird in your hand is as if you’re holding air. Anna looking at me as I take her picture. 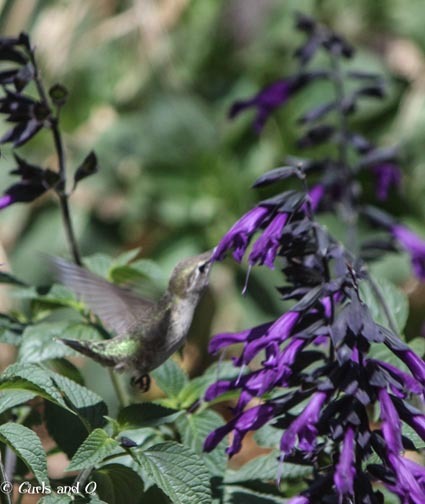 Anna loving the purple salvia. Male Anna’s enjoying the Verbena flower’s nectar. 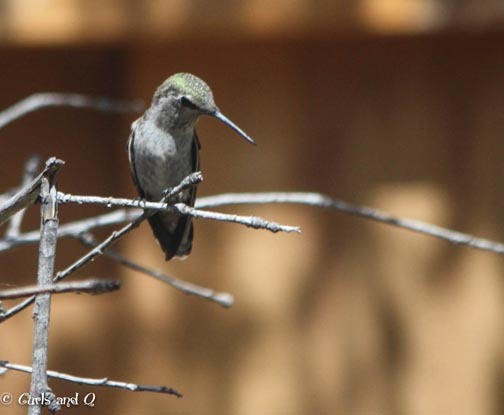 I actually dusted off my Canon Rebel XSi with the 55 – 250 mm zoom lens to take pictures. My Anna’s deserve better than the iPhone point and click! 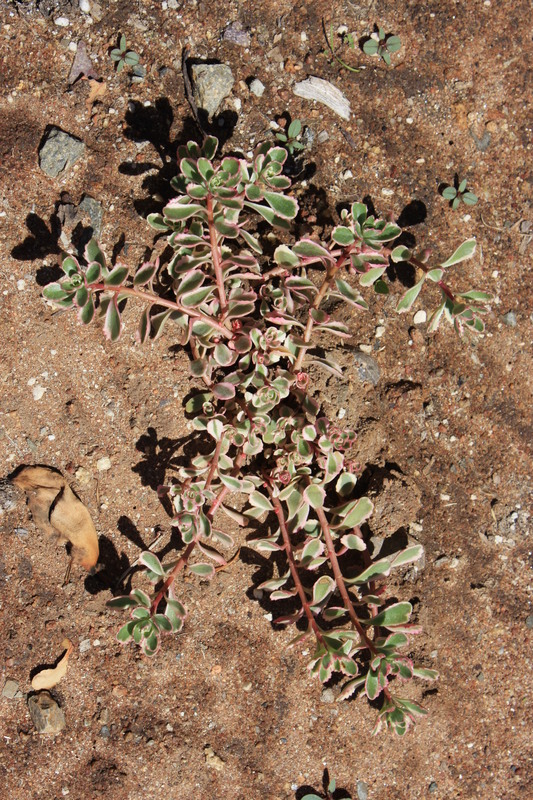 – What is eating my plants? 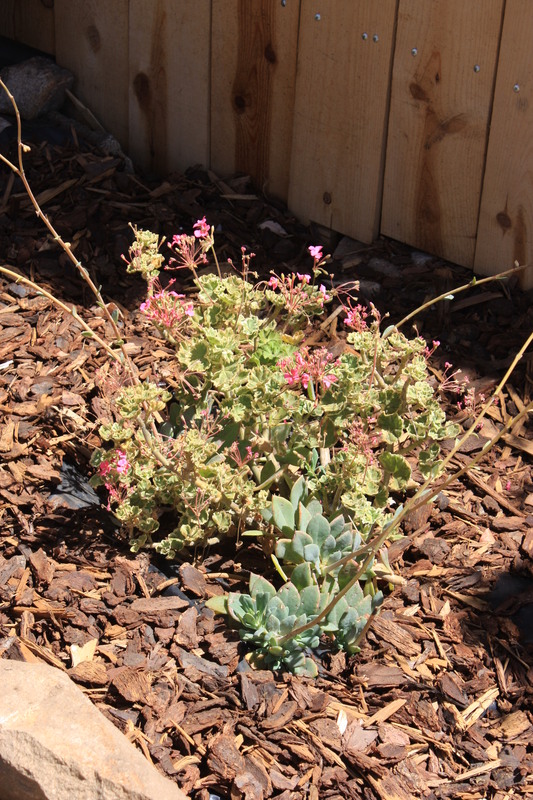 When my ground cover was gone over night, I thought it was rabbits. 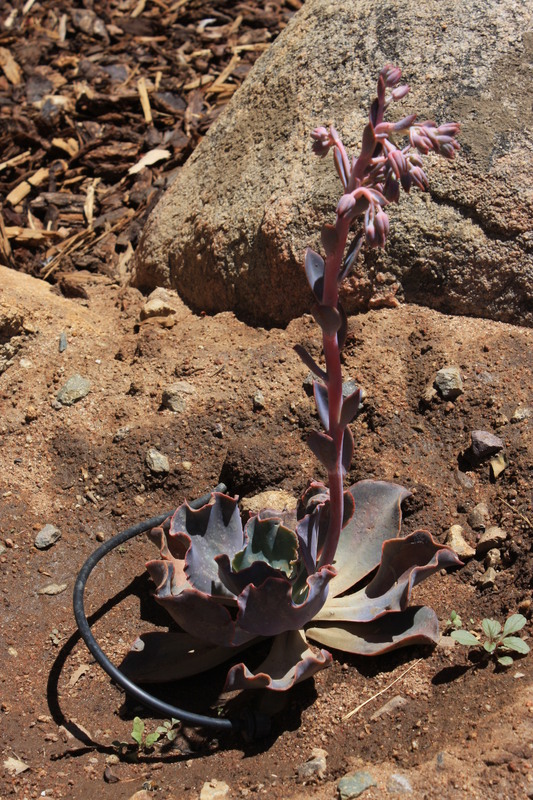 First, I rabbit-proofed most of my plants. 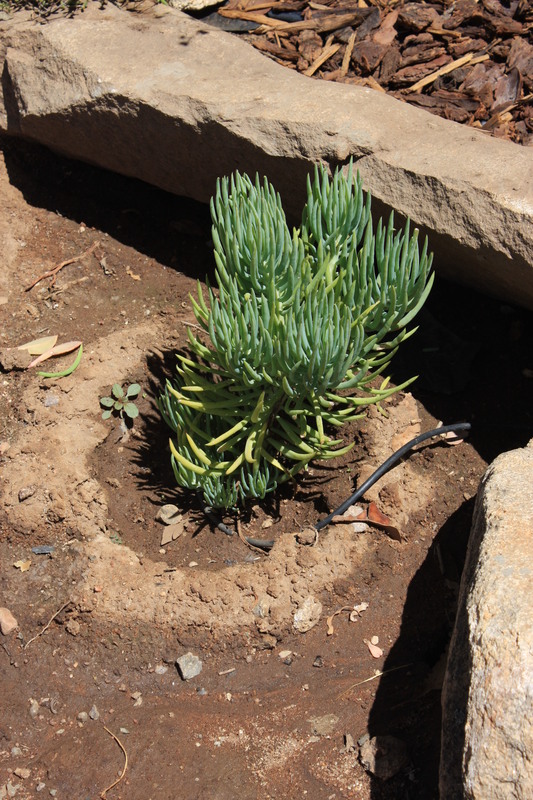 Then, I saw a squirrel digging up the roots of the ground cover. 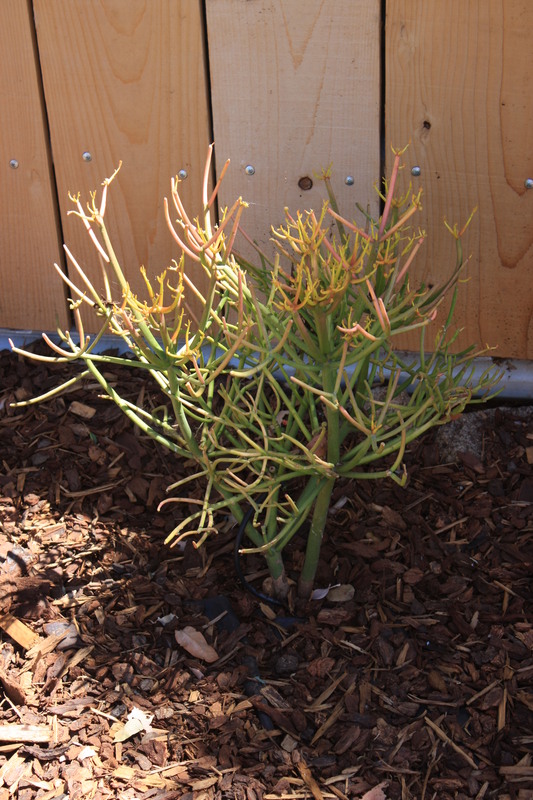 Each day I go into my yard and find some new damage to my plants. 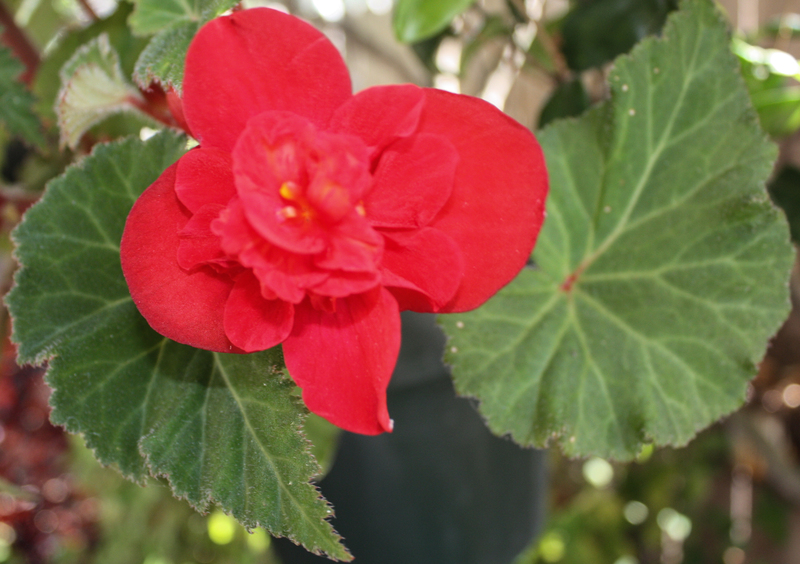 ~A few years ago we purchased a few beautiful begonias from Weidner’s nursery. If you live in the San Diego area, this is a can’t miss place. 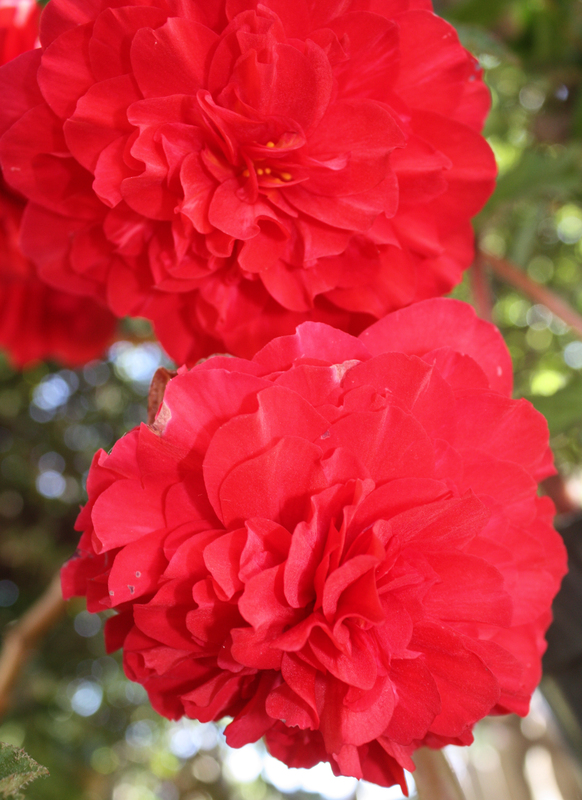 Fabulous flowers and the most amazing begonias. Not your typical nursery. 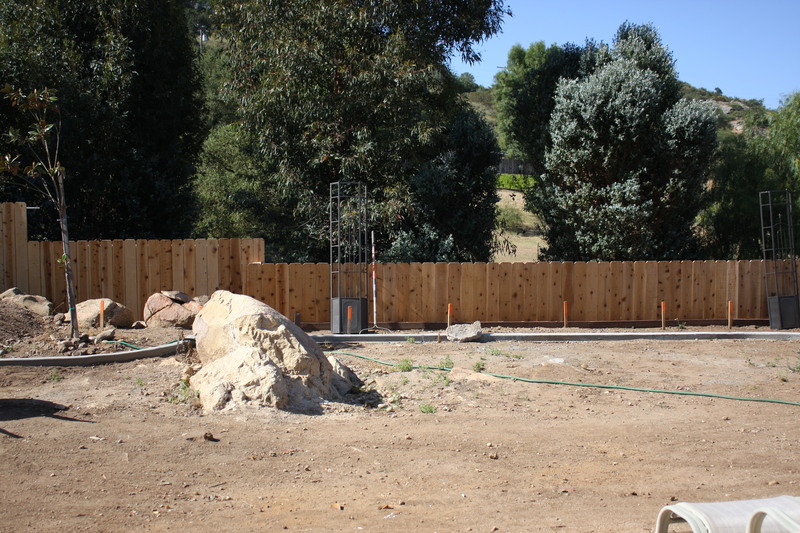 – Well the backyard is coming along fantastically. 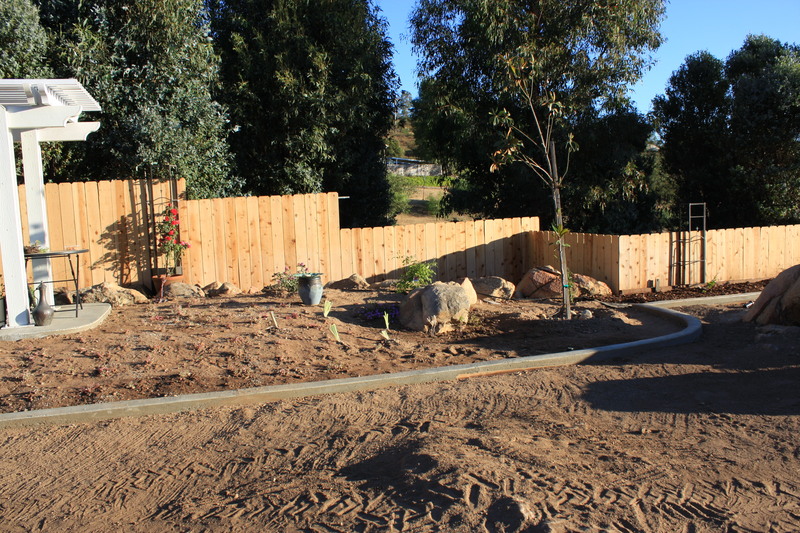 Thought I would share how I went about planning my backyard paradise. 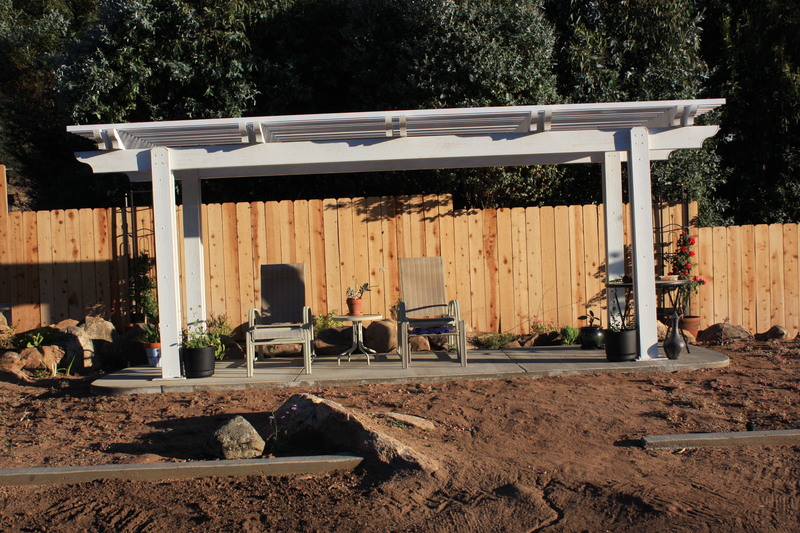 After my husband finished the wood fence, the cement boarder, and the pergola, I took three different shots of my backyard (see above). The photographs were printed out on 8 x 10 paper. 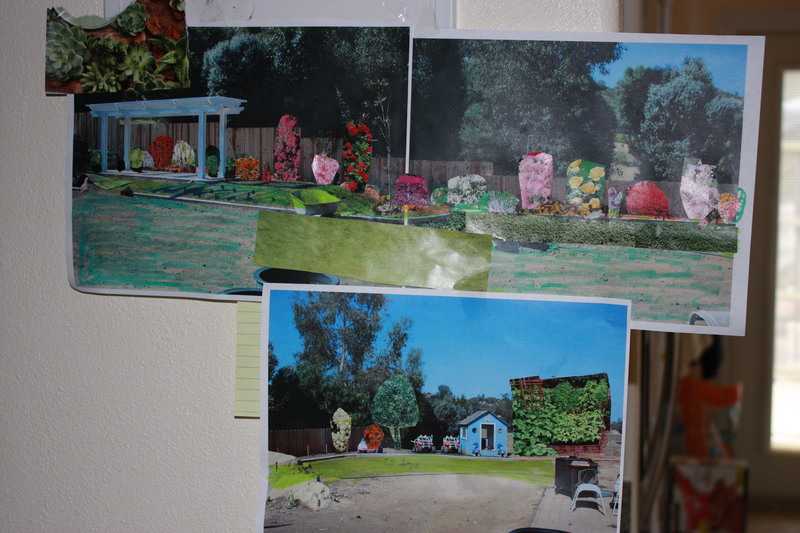 I taped the two pictures on the above left together (see below) and started creating my backyard. 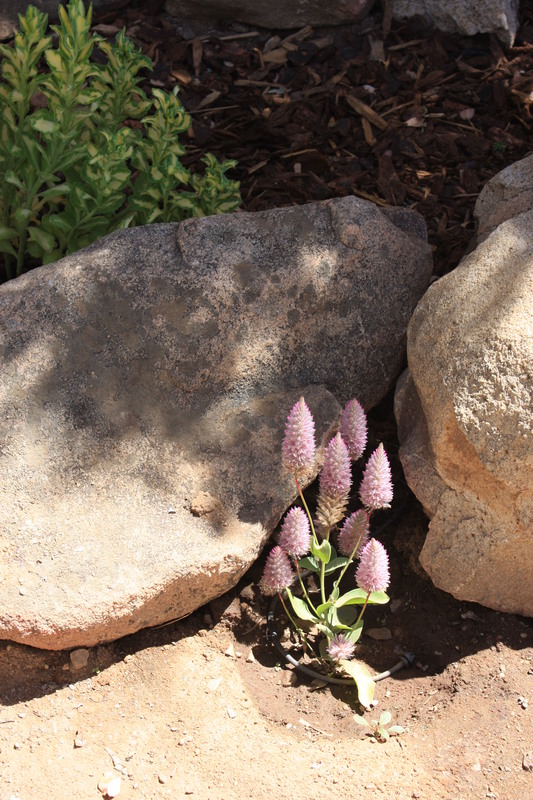 I used this technique before when planning the landscaping for a small area in the front yard. I started drawing in the plants as I had done before, but this just was not turning out the way I had envisioned. I was in a quandary, what should I do? Then it hit me, why not use the catalogs from the flower companies. Cutting out the colors and sizes I wanted, I pasted them into correct place in the picture. This was a perfect rough draft for the layout of my garden! What do you think? Cool or what. 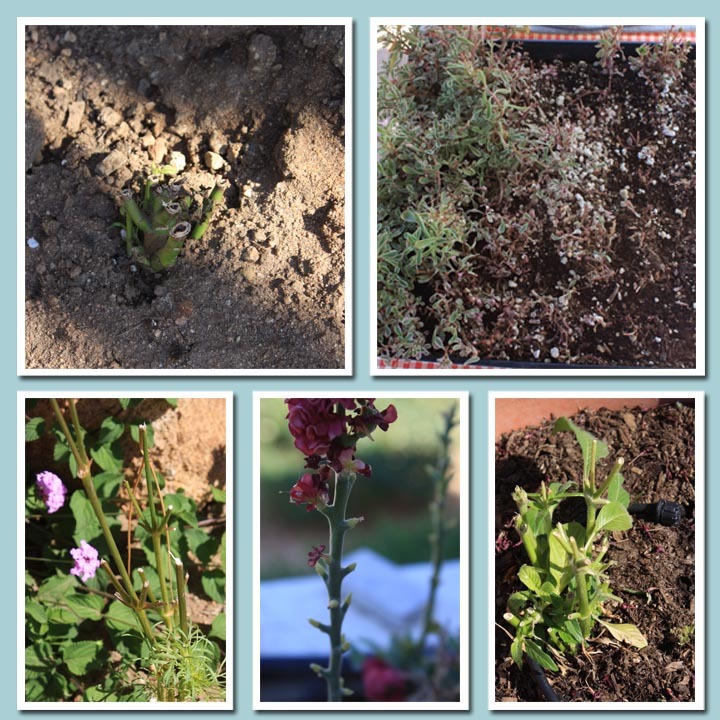 It is going to take a while for the plants to grow, and I still have some smaller plants to put in. I can add them anytime. Note: No grass. We will be putting that in when it gets cooler which is usually the end of September or October. You can see the outline of where the grass will be. 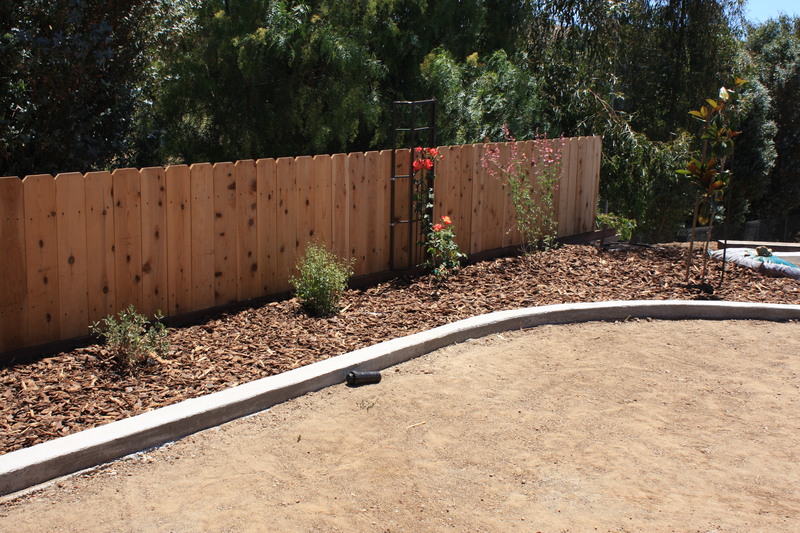 We used drip line to water and put plastic down then wood chips on top. 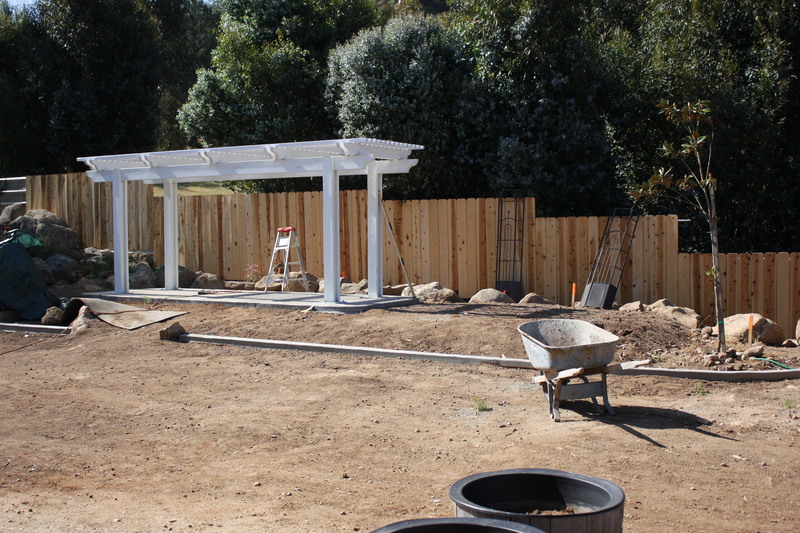 We are still creating the walk up to the pergola. As I said, “I can’t stop looking for new ideas.” Now I see yard art everywhere. 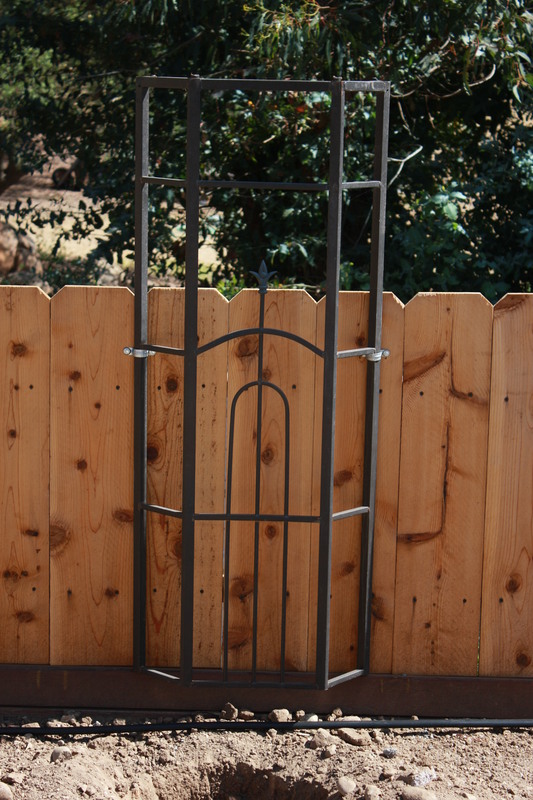 My husband was taking down and old patio cover for our son, and I thought the corners would make great trellises for the yard. My husband attached two larger trellises to the fence, I am going to have a rose climb up one and wisteria up the other one. Doesn’t this look great? We are in the process of finishing our backyard. Note: We have been in the house since 2003. 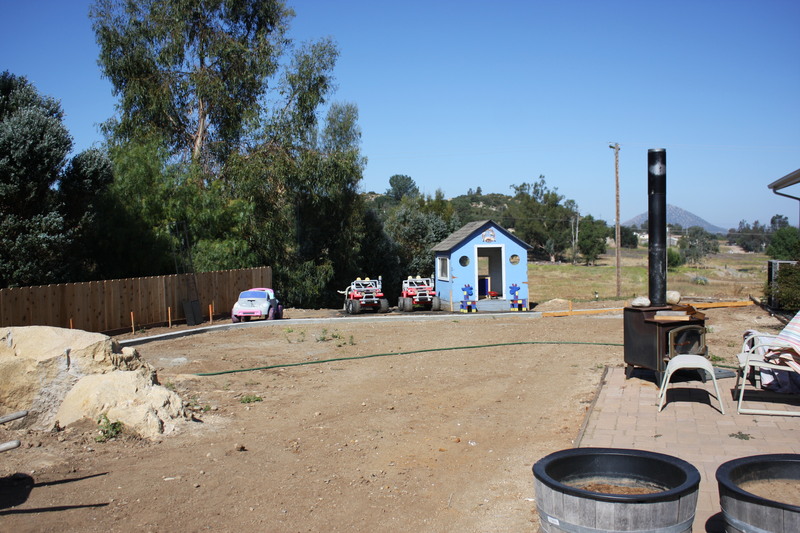 We have four plus acres, but our backyard is only fifty-five feet, so it has not been a first priority. The orchard and plants in front have taken up most of our time. He took the other two and cut them down and attached them to the small three foot fence. These smaller ones are going to have roses growing on them. 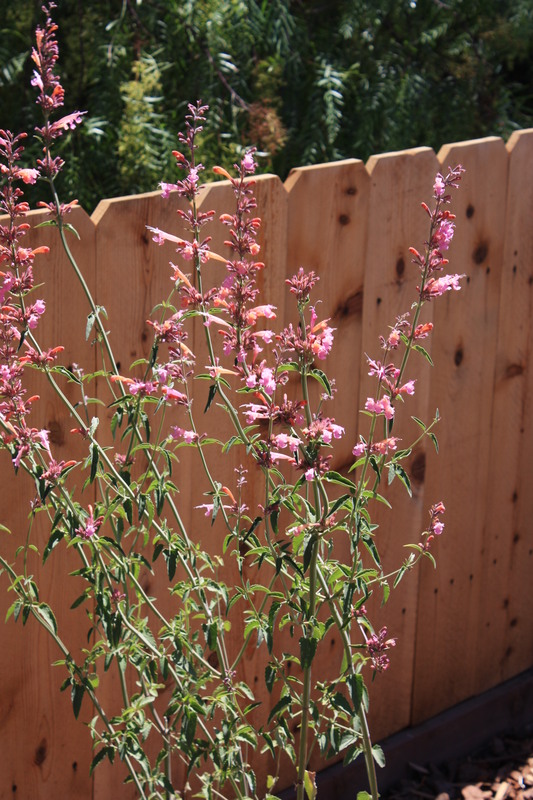 I am so excited to finally have a back yard with plants and flower to look at. Dirt and rocks was getting old. The other cool idea from Birds and Blooms, was to find an old serving bowl and turn it into a bird bath. I just found a great one from the Goodwill Store. To be continued…. – It all started with my sister. She lent me some Birds & Blooms magazines. This magazine has some of the most interesting ideas to make. Now I can’t stop looking for new ideas for my garden. I see them every where. 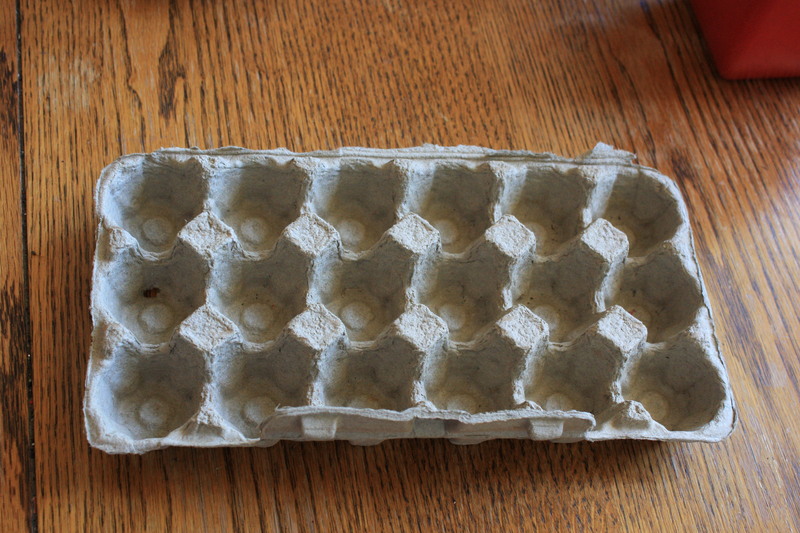 Oh I can use egg cartons for seed starters. 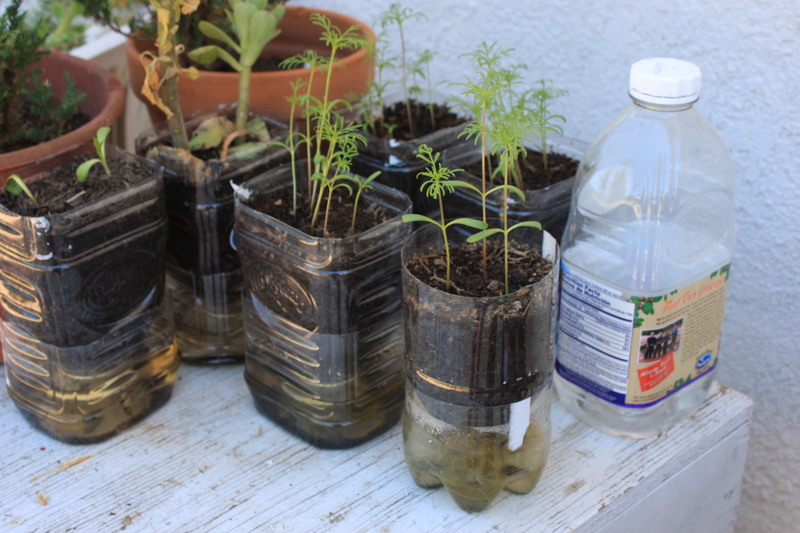 I have made fire starters out of egg cartons, but I have never used them for seeds. I went on line to order some safflower seeds that Q wanted to grow. The first batch of seeds I planted just one came up. I called Q and said something was eating my seeds and leaving the shell. She told me it was birds. I wasn’t aware that the birds would eat the seeds, so I put plastic over the top until they started to sprout. I use what Q calls “the sponge effect” to water. You water from the bottom. 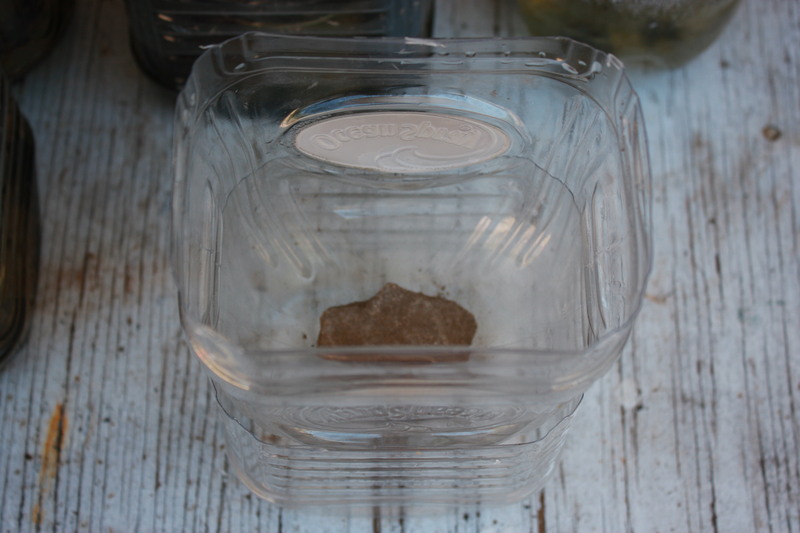 The water is soaked up by the carton and keeps the seeds and plants moist. Then I found another great idea, you guessed it, in another Birds & Blooms, to transfer my seedlings to. Well you guessed it. 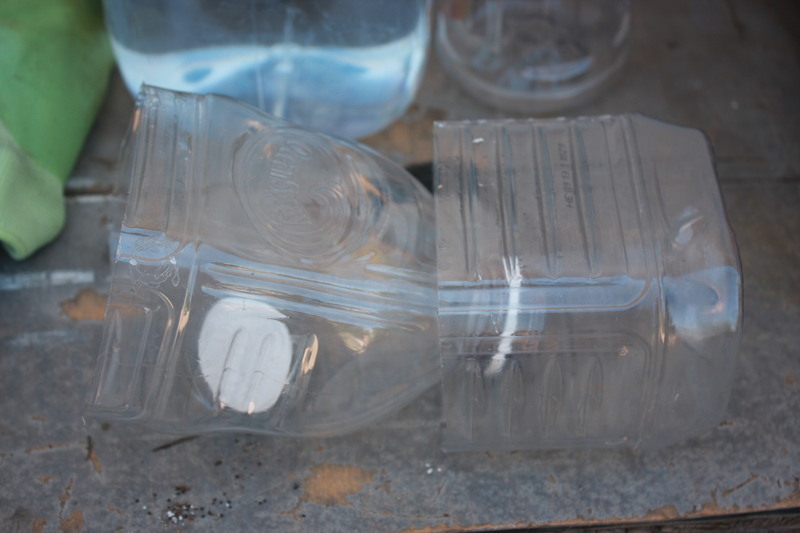 Recycle your plastic juice or soda container. 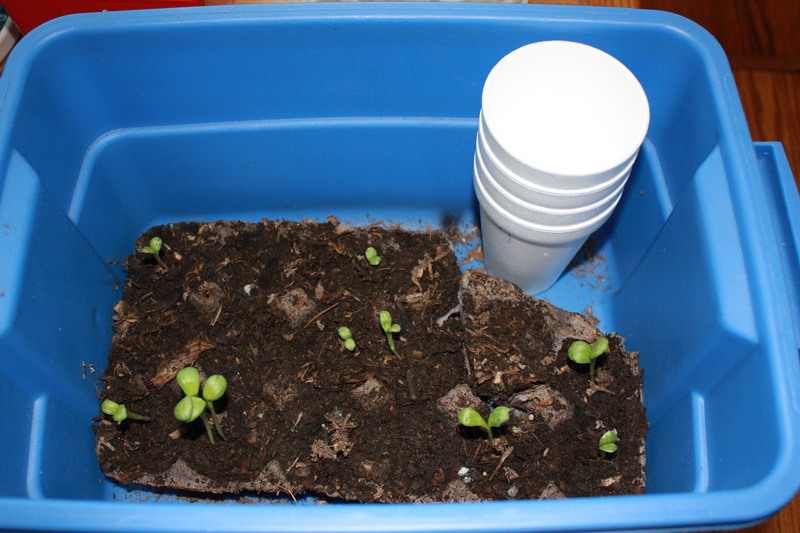 I planted cosmos in four of the containers and have transplanted some of the safflower seedlings. I like the square juice jars. They fit great together. 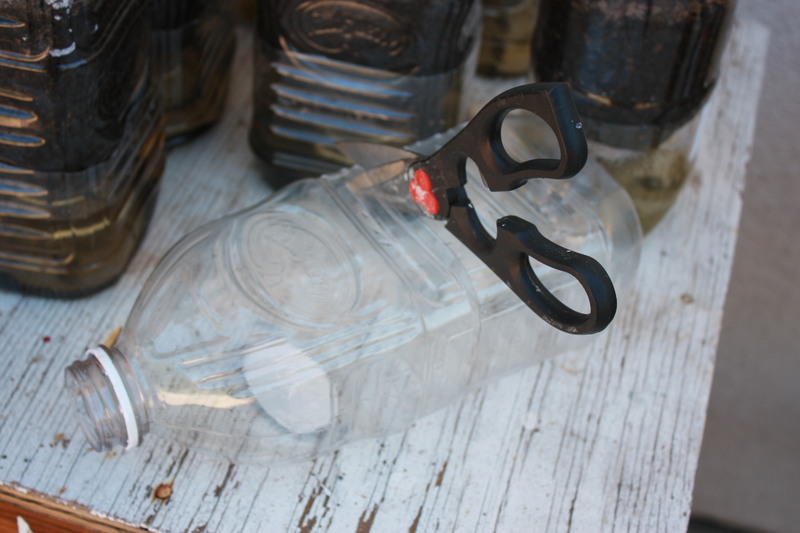 Here is how to change that juice or soda jar in to a planter. Place a rock in the bottom. Fill with soil. Use “the sponge effect” here, also, to water. This all start because of my wonderful sister giving me something to read! STOP! Don’t throw those bits of yarn from knitting and fluff from spinning. 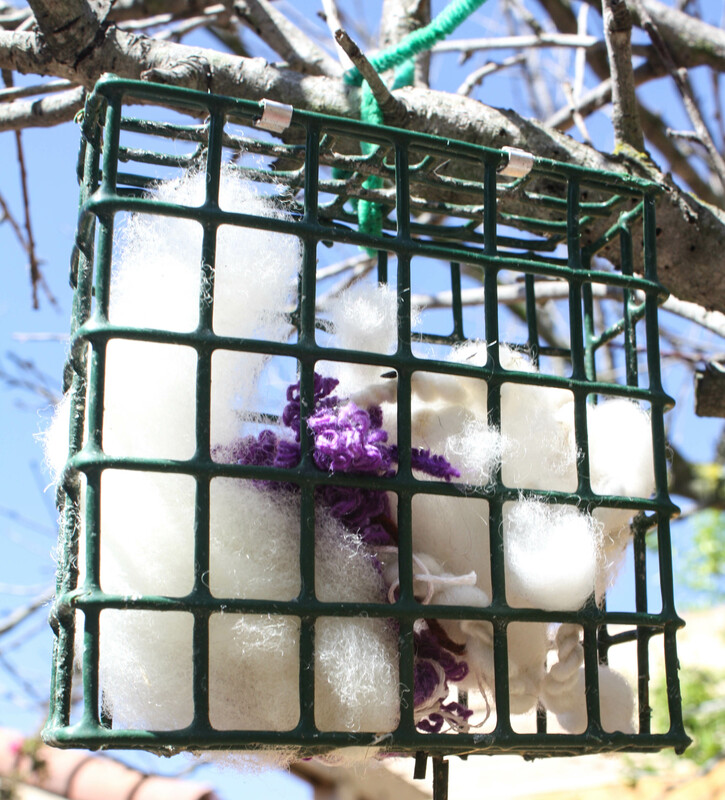 Put the no-longer-needed-because-it’s-Spring suet holders to use. I packed mine full of fluff and yarn. You can see that the birds have been having a great time pulling out the bits and using in their nests. It’s fun to see a bird with a beak full of fluff! This was full. I have it right by the bird feeders. A beautiful have-to-be-outside day! You can see the blue skies in the background. 😎 The Texas Privet is abuzz with bees and giving off a heavenly smell. Too bad it is so MESSY! The scent is drawing me out! 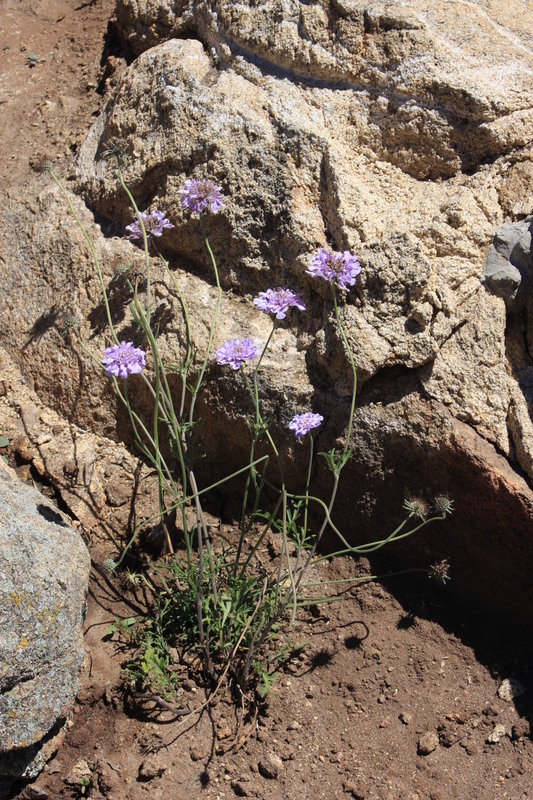 Time for birds, butterflies, and flowers!